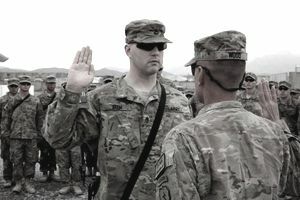 National Guard enlisted members are required to take a similar oath, swearing additionally to obey the orders of the Governors of their states of enlistment. Military discipline and effectiveness are built on a foundation of obedience to orders. Recruits are taught to obey orders from their superiors immediately and without question, right from day one of boot camp. Military members failing to obey lawful orders issued by their superiors risk serious consequences. Article 90 of the Uniform Code of Military Justice (UCMJ) outlines the crime of willful disobedience by a military member a superior commissioned officer. Article 91 covers willful disobedience of a superior Noncommissioned or Warrant Officer. Article 92 conveys what constitutes the crime of disobedience of any lawful order (the disobedience does not have to be "willful" under this article). These articles require the obedience of LAWFUL orders. Not only should an unlawful order not be obeyed, obeying such an order can result in criminal prosecution. Military courts have long held that military members are accountable for their actions even while following orders. "I Was Only Following Orders. " "I was only following orders," has been unsuccessfully used as a legal defense in hundreds of cases (probably most notably by Nazi leaders at the Nuremberg tribunals following World War II). The first recorded case of a United States Military officer using the "I was only following orders" defense dates back to 1799. During the War with France, Congress passed a law making it permissible to seize ships bound for any French Port. However, when President John Adams wrote the authorization order, he wrote that U.S. Navy ships were authorized to seize any vessel bound for a French port, or traveling from a French port. Pursuant to the President's instructions, a U.S. Navy captain seized a Danish Ship (the Flying Fish), which was en route from a French Port. The owners of the ship sued the Navy captain in U.S. Maritime Court for trespass. They won, and the United States Supreme Court upheld the decision. The U.S. Supreme Court held that Navy commanders "act at their own peril" when obeying presidential orders when such orders are illegal. The Vietnam War presented the United States military courts with more cases of the "I was only following orders" defense than any previous conflict. The decisions during these cases reaffirmed that following manifestly illegal orders is not a viable defense from criminal prosecution. In United States v. Keenan, the accused (Keenan) was found guilty of murder after he obeyed an order to shoot and kill an elderly Vietnamese citizen. The Court of Military Appeals held that "the justification for acts done pursuant to orders does not exist if the order was of such a nature that a man of ordinary sense and understanding would know it to be illegal." (Interestingly, the soldier who gave Keenan the order, Corporal Luczko, was acquitted by reason of insanity). Probably the most famous case of the "I was only following orders" defense was the court-martial of First Lieutenant William Calley for his part in the My Lai Massacre on March 16, 1968. The military court rejected Calley's argument of obeying the order of his superiors. On March 29, 1971, Calley was convicted of premeditated murder and sentenced to life in prison. However, the public outcry in the United States following this highly-publicized, controversial trial was such that President Nixon granted him clemency. Calley wound up spending 3 1/2 years under house arrest at Fort Benning, Georgia, where a federal judge ultimately ordered his release. In 2004, the military began court-martials of several military members deployed to Iraq for mistreating prisoners and detainees. Several members claimed that they were only following the orders of military intelligence officials. Unfortunately (for them), that defense doesn't fly. The maltreatment of prisoners is a crime under both international law and the Uniform Code of Military Justice (see Article 93 — Cruelty and Maltreatment). It's clear, under military law, that military members can be held accountable for crimes committed under the guise of "obeying orders," and there is no requirement to obey orders which are unlawful. However, here's the rub: A military member disobeys such orders at his/her own peril. Ultimately, it's not whether or not the military member thinks the order is illegal or unlawful; it's whether military superiors (and courts) think the order was illegal or unlawful. Case in point: In 1995, Spec-4 Michael New was serving with the 1/15 Battalion of the 3rd Infantry Division of the U.S. Army at Schweinfurt, Germany. When assigned as part of a multinational peacekeeping mission being deployed to Macedonia, Spec-4 New's and the other soldiers in his unit were ordered to wear United Nations (U.N.) helmets and armbands. New refused the order, contending that it was an illegal order. New's superiors disagreed. Ultimately, so did the court-martial panel. New was found guilty of disobeying a lawful order and sentenced to a bad-conduct discharge. The Army Court of Criminal Appeals upheld the conviction, as did the Court of Appeals of the Armed Forces. What about an order to participate in a dangerous mission? Can the military legally issue a "suicide mission" order? You bet they can. In October 2004, the Army announced an investigation of up to 19 members of a platoon from the 343rd Quartermaster Company based in Rock Hill, South Carolina, for refusing to transport supplies in a dangerous area of Iraq. Can they be punished for this? They certainly can. An order to perform a dangerous mission is lawful because it's not an order to commit a crime. Under current law, and the Manual for Courts-Martial, "An order requiring the performance of a military duty or act may be inferred to be lawful and it is disobeyed at the peril of the subordinate. This inference does not apply to a patently illegal order, such as one that directs the commission of a crime." In fact, if it can be proved that one or more soldiers influenced others to disobey, they may find the crime of Mutiny added to the list of charges, under Article 94. Mutiny carries the death penalty, even in times of peace. To Obey, or Not to Obey? So, to obey, or not to obey? It depends on the order. Military members disobey orders at their own risk. They also obey orders at their own risk. An order to commit a crime is unlawful. An order to perform a military duty, no matter how dangerous, is lawful as long as it doesn't involve the commission of a crime.